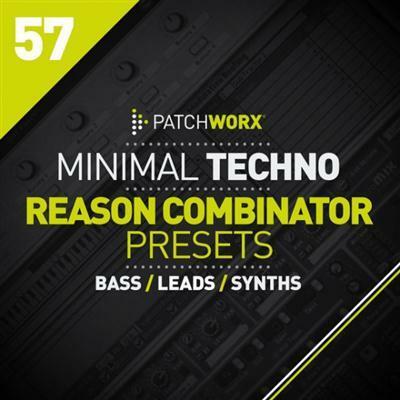 Patchworx 57 - Minimal Techno for Reason features 64 Combinator patches and 2 Kong Drum Kits for Propellerheads, Reason 7+. Featuring a huge range of cutting edge sounds for Minimal electronic productions from Synthetic Percussion to Fragile Chords, Deep Basses and Atmospheric Synths created exclusively for Loopmasters by Dan Weatherall. Dan has created a wonderful sound bank of deep textured synths that really show off the powerful flexibility of Reason's Combinator device with clever routing using many of Propellerheads inbuilt Synths and Fx including Thor, Maelstrom, Subtractor alongside the many creative effects such as Pulveriser, MClass EQ, Scream and the Chorus. Patchworx 57 Minimal Techno Combinators feature fully assigned knob controls ready for tweaking, each sound has been carefully sculpted to cut through a mix with ease whilst keeping maximum authenticity to the style at all times. Also included are 5 Reason audition song templates for the following presets, Basses, Chords, Drums, Mono Synths, and Poly Synths plus Wav loops of every preset for instant inspiration. Featuring 64 Combinators 2 Kong Kits and 192 Midi Files, including 12 Warm Fat Basses, 12 Lush Chord Instruments, 3 Punchy Drum Sounds 19 Poly Synths and 18 Mono Synths - this is a great collection of quality sounds and inspiration to raise your Deep Minimal Techno production to the next level! If you are inspired by the sounds of Minilogue, Slam, Damian Lazarus, Marco Dassi, Radio Slave and Layo & Bushwacka to name but a few, then check out the demo and sample Minimal Techno Synths for Reason from Loopmasters TODAY!